The last time I reviewed a ZIIIRO watch ZIIIRO Celeste Watch Review and Giveaway ZIIIRO Celeste Watch Review and Giveaway I'm not much of a watch person. Between 1995 and 2012, I've only owned two watches, and both of them were relatively nondescript, plain and unattractive. Read More , I absolutely fell in love with it. To be honest, I nearly didn’t want to part with it. Now, the designer watch company has just released a brand new model called the ZIIIRO Saturn. Will it fill the void in me left by the ZIIIRO Celeste? How will the ZIIIRO Saturn, a somewhat digitised version of the ZIIIRO Celeste, hold up against my expectations? Will I like this €179 watch as much, and be willing to recommend it as highly as I did its predecessor? We’ll just have to find out. We’re also giving this designer watch away, so read the review for more details on how you can be the one who wins it! ZIIIRO takes the mundane act of time-telling onto a whole new level of excitement. And as you may have read in my review of the Celeste ZIIIRO Celeste Watch Review and Giveaway ZIIIRO Celeste Watch Review and Giveaway I'm not much of a watch person. Between 1995 and 2012, I've only owned two watches, and both of them were relatively nondescript, plain and unattractive. Read More watch, its unique clock face design is not just pretty to look at, it’s also entertaining. It attracts quite a bit of attention from friends and random strangers. Even though the ZIIIRO Saturn is €30 dearer than the Celeste, it is slightly more subtle — which may or may not be a good thing, depending on your needs and preference. The Saturn is available from ZIIIRO’s online shop and it comes in three colours. At the time of writing, the black model is unavailable but luckily for you, this is the one we’re reviewing. The reason for purchasing a geeky designer watch such as this is to enjoy its quirkiness. There’s no point in buying this watch only to be frustrated from deciphering it. Absolutely none — you’d be better off with a regular watch. Luckily though, the Saturn is quite accommodating in the sense that it is rather similar to any analogue watch in the way it tells time. The Saturn features an always-on monotone LCD which displays time in the form of propelling rings, without any other visible markings. The longer, outer rings indicate the hour, while each individual inner segment represents a minute. Interpreting the time needs a bit of practice, but it’s surprisingly easy to get used to. After wearing it for a day, it becomes rather natural. Unlike the Kisai Online LCD watch Tokyoflash Kisai Online LCD Watch Review and Giveaway Tokyoflash Kisai Online LCD Watch Review and Giveaway Does this futuristic watch deserve a spot in your watch box? Does it look as good in person as it does online? Is the design practical and suitable for everyday use? Read More which I reviewed earlier, the Saturn’s LCD has awesome contrast, which makes it easy to read even under strong, direct sunlight. It also sports a handy electroluminescence backlight for night viewing — and I must add that the glow of the EL light is bright enough to be seen even during daytime. Like the Celeste, the ZIIIRO Saturn is very well constructed. Its 45mm case and strap are both made from stainless steel and feels very solid. Although the watch is supposedly unisex, it may not be suited for ladies simply because of how large the case is. The weight is distributed fairly evenly across the entire ensemble, assisted by the fact that the case is only 10.5mm thick, which is roughly the same thickness as your average luxury watch. The strap is identical to the one fitted on the Celeste — a stainless steel mesh design with an adjustable buckle and a hook-on clasp. Being adjustable, you’ll find it amazingly easy to reposition the buckle to fit your wrist without a visit to the watch shop, saving you both precious time and money. I haven’t had any issues with the mesh strap catching the fine hairs on my wrist. However, the mesh design has a tendency to trap water droplets, and therefore, takes a long time to dry after washing my hands. The watch is also waterproof up to 3 ATM, and is able to withstand perspiration, rain and washing but should not be worn while swimming. As you may have noticed, this is a digital watch; and as such, doesn’t feature a crown. Instead, the time is adjusted by pressing on two buttons on the back of the case. This is fine if you only need to set the time once, but for me, I travel quite a bit. It can get rather tedious having to search for something pointy to set the time with. In those cases, I’d much rather wear an analogue watch — digital isn’t always better. Overall impressions? I’m happy with the watch. I love the way it looks and feels on my wrist. I enjoy the fact that it’s something different, and catches the attention of the people around me. Unfortunately, I can’t say the same for ZIIIRO’s customer support. You see, this particular watch has a minor flaw — it has a pretty large speck of dust in the case, just under the glass. It may not be visible in these photos, but trust me, it’s there. According to ZIIIRO’s Returns & Exchanges Policy, I’m entitled to an exchange if I’m unhappy with the purchase (which is the case) within 14 days of receiving the watch. The first part of the procedure is to obtain a Returns Number by contacting ZIIIRO’s customer support. I sent an email on 2 January 2013 but to my disappointment, I have yet to receive a response. The company’s live chat support is never attended to, regardless of the time of day. And there’s no other way of contacting them other than email or the contact form — the company doesn’t publish a physical address or telephone number, which I find to be really dodgy. So while the quality of the watch is great, their customer support is dismal. After paying €179 for a watch, I expected a whole lot more. Come on, ZIIIRO. Buck up! Should you buy the ZIIIRO Saturn watch? Despite their nightmarish customer support, the watch itself is great (if there isn’t any dust in it). It’s well built. It’s beautiful, elegant and geeky at the same time. So I find no reason not to recommend it. How do I win the ZIIIRO Saturn watch? Please fill in the form with your real name and email address so that we can get in touch if you are chosen as a winner. MakeUseOf giveaways are open to readers worldwide*. The giveaway code required to activate the form is available from our Facebook page and Twitter stream. The giveaway is over. Congratulations, Dan Nguyen! You would have received an email from jackson@makeuseof.com. If you require any assistance, please get in touch with Associate Editor Jackson Chung before Feb 20. Enquires beyond this date will not be entertained. You’re almost done. Now, all that’s left to do is to share the post! By participating in this giveaway, you agree to the giveaway rules. *Exclusions apply. See giveaway rules for further details. This giveaway begins now and ends Friday, February 8th. The winner will be selected at random and informed via email. Spread the word to your friends and have fun! Interested in sponsoring a giveaway? We’d love to hear from you. SO after receiving the watch, it is absolutely brilliant! I love it and it's so sleek and modern. The occasions I wear it to span from work to a fancy dinner and it just fits perfectly. Telling the time is a cinch after a few days and the strap stays on once it's placed into position. In addition to Jackson's review, I agree that if you're interested in this watch to go ahead and buy it! It's worth it. Thank you!!!!!! hello once again guys ... so who's the winner ? We will be selecting the winner shortly. So, who is the winner? Please show us list of the winner, we want to know. Need more well defined entry form, too confusing! Looks really nice! :P And i am in need of a new watch. So this would be awesome to have. Looks like an awesome watch with a wonderful design. Looks like a cool thing to look into. Great review. Watch looks great an' all. . . even looks transparent in the first screenshot, but I guess that's just a reflection from your face perhaps. And oh, lest I forget, I woulda loved it if you'd shown more screenshots related to time-telling - i.e. screenshots of the watch (dial) set at different times-of-day so we'd have better understanding of it. Nice one Jax! That is such a fantastic watch. I must get him a gift so he will not whine. And it would also cover his Valentine!! man...i should be tired by now waiting for my time to win, but i know i shouldn't...i'm gonna win this one! thanks for reviewing! Regarding the customer support issues - It's not that we are dodgy or anything :D it's just that we're only 3 guys handling everything, so we're pretty busy often. Anyway, not making excuses - the brand is still young, and we're thankful for knowing what can be improved. Glad you like the watch! Awesome. Thanks for dropping by, Robert. The look of the ZIIIRO is stunning. What a conversation piece. Thanks for sharing. The watch is just awesome ! 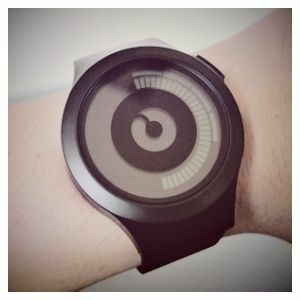 I want one so much!Truly a minimalist designer watch. What do you mean by "the quality of the watch is great"? It has DUST inside. The quality of the watch is terrible 'just' because of that. must have watch! Thanks Ziiiro! Goodluck pips! :) You're the best Makeusof! MakeUseOf is great!! I am new to computing and it has proven itself very valuable to myself as a great learning tool and source!THANKYOU!!!! I really don't know what to make of all those hipster like products these days.Thanks. This watch looks awesome and my old faithful watch busted about a month ago. I hope I win because I would love to sport a watch like this. Thanks for the review and the giveaway!! This is an absolute beauty. Will surely turn heads! pre-ordered a saturn just after reading your ziiiro review last december and got it after one week. sorry to hear that you're having difficulty to contact them. The watch is well made and attention magnet to people because of its large display . I have gun-metal color which kinda looks a little minus so a black could be better though. and not ok for formal occassions. Reading the time will take some time but i like that fact that i can read time up to exact minutes but not recommended to look at it while driving since it will distract on attention on the road. Nice! I'm glad I was able to convince you to get one. I loved the Celeste. Saw a comment someone wrote: "I will win a giveaway someday.I hope." Hang in there brother! It'll be worth all the wait [and ALL the hope]! That is one of the neatest watches I have seen. I would be ecstatic if I won that. Thank you for this geek giveaway. pretty neat, give me one! This website is exciting to browse. All articles are interesting. I'm excited to participate in this competition. I desire to own the Saturn watch. Very interesting article. Is there anything they can't make a watch do? Wear a watch and carry a phone? Not for me thanks. But good luck to someone. I love the mesh band. It doesn't look cheap like plastic bands or like it will rip the hair out of my wrists like normal metal bands. What a really cool watch!!! How awesome would it be to have one???? Please and thank you!!!! Cool watch, love the animated dial and mesh band. Thank you for all the giveaways! My husband would love this watch.I shared this giveaway on facebook as Carolyn Barnett and tweeted as @CarolynRBarnett and shared on google + as Carolyn Barnett. Thanks for a great review of a nice product. Didn't like the Kaisai but this looks good. Shame about the cust serv. I want this watch, but at the current price, I don't want it. Truly a minimalist designer watch. Very nice. Hope I win it!!! Thanks Jackson for the review and as always, giving everybody the chance to own one. Awesome watch! I want one so much! I will win a giveaway someday.I hope. I never win i want to WINN !!! Thank you for the great articles ! Cool! Love to win it! Nice watch I would definitely give to one of my sons for their birthday! I would like to enter your sweepstakes but I do not use Facebook or any of those sites because every time I try them I find they strip my contacts list and email people or start sending me phony email contacts from others. I just came upon makeuseof dot com this week and I'm enjoying the articles and reviews. The ZIIIRO Saturn watch review is excellent. Thanks! Glad to see this competition is running again. Still hope to win this beautiful watch. Always check the time on my phone but with this watch on my arm I'll never take my phone out in public again...except when I answer a call. Another Giveaway?! At this rate, I hope I win one :) Oh, I'm loving MakeUseOf. Brilliant! Recently joined and I am totally surprised by the amount of awesome giveaways and rewards, it really does reward readers for being active. Cheers, Scott. Positive comments like yours goes a long way. Jackson Chung, M.D. is MakeUseOf's Chief Executive Officer. Despite having a medical degree, he's always been passionate about technology, and that's how he came to be MakeUseOf's first Mac writer. He has close to 20 years of experience working with Apple computers. Fitbit Charge 3: Why Would You Want Any Other Wearable?